LANDMARK STATUS. 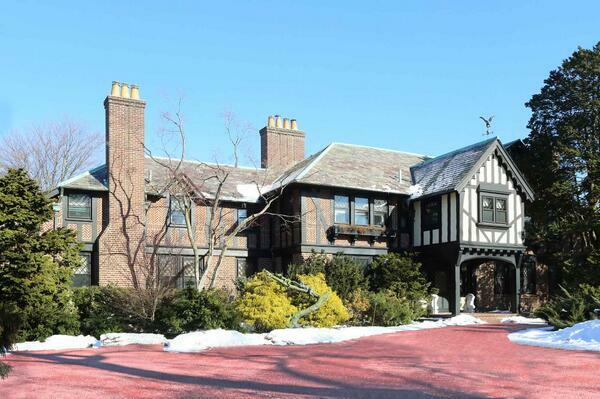 The Hempstead Town Board held two public hearings to consider granting landmark status for the former site of Eleanor Roosevelt’s childhood home in Westbury and a historic black cemetery in Wantagh earlier. Both sites were unanimously approved for national landmark status. Read Aisha Al-Muslim’s Twitter updates below. Hempstead Town critic Felix Proccaci asks town board to post details of resolutions online for upcoming bond hearings for special districts. More Twitter updates from Newsday and its staff. NBA commissioner Adam Silver: @MagicJohnson is always welcome as an owner, and a member of the @NBA family. ALSO: @LAClippers owner Donald Sterling will be fined $2.5M for racist comments. 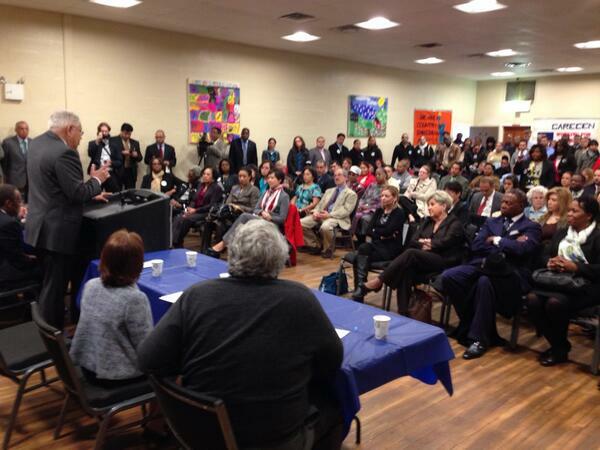 The "Pathway to Citizenship" program launched in #NY Nassau today will aid legal residents seeking citizenship and degree credentials. #NY Sec of State Perales told #Hempstead crowd that @SenSchumer still "is convinced" #immigration reform is happening this year. 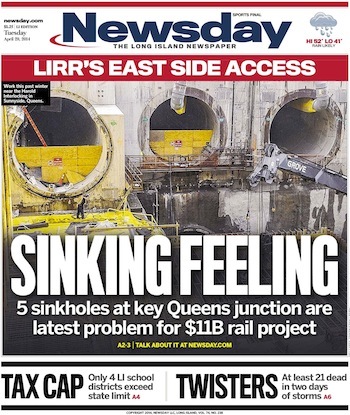 FRONT PAGE - SINKHOLES SURFACE AS LATEST WOE FOR TROUBLED EAST SIDE ACCESS - The MTA's East Side Access Project to link the LIRR to Grand Central Terminal, already plagued by years of delays and billions in cost overruns, has encountered yet another setback: sinkholes. 4 LI DISTRICTS WANT TO BUST TAX CAP, LOWEST NUMBER EVER - Only four Long Island school districts are challenging state tax caps in their proposed 2014-15 budgets -- the lowest number ever -- with educators acknowledging that cap-busting efforts face growing obstacles. JUDGE WANTS TRIAL FOR EX-YANKEE IN MOLESTING CASE - A Nassau County judge Monday declared he was ready to "go to battle" to ensure the trial of an ex-Yankees outfielder accused of molesting an 8-year-old girl begins soon. HEMPSTEAD TOWN PROBES 'HATE-FUELED RACIAL INCIDENT' - In a news release, officials said they "are responding to a picture of a monkey that was apparently displayed on a Highway Department bulletin board, making reference to an African-American employee." 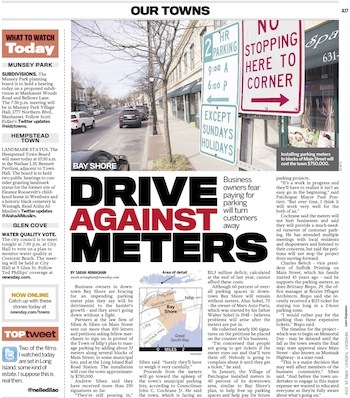 OUR TOWNS TOP STORY: ISLIP WANTS TO INSTALL METERS IN BAY SHORE - Business owners in downtown Bay Shore are bracing for an impending parking meter plan they say will be detrimental to the hamlet's growth - and they aren't going down without a fight.